The resources on this page provide education and guidance for clergy and faith leaders in responding to suicide and other mental health issues in their congregations. An easy resource for looking up references for faith leaders, this free downloadable PDF is arranged as a quick reference guide for Clergy. 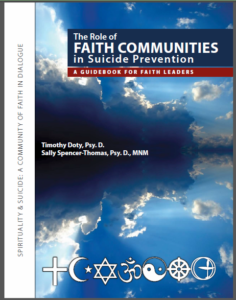 A PDF guide for faith leaders to learn easily about suicide prevention and faith communities. 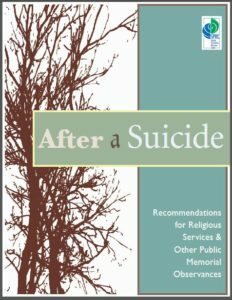 A PDF collection of sermons, church bulletins and support tips for helping those who have lost a loved one to suicide. 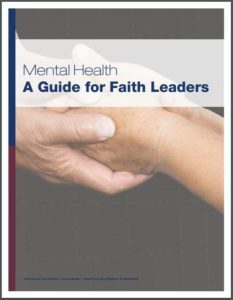 Download this free guide published by the Mental Health and Faith Community Partnership. An indispensible resource for faith community leaders and staff. Vol. 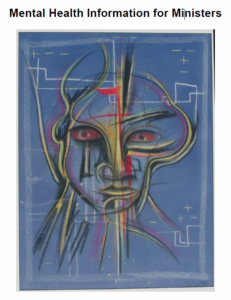 9, Issue 2, Fall 2012: Discussion of suicide prevention, veterans concerns, loss to suicide, a eulogy for a suicide victim and a discussion from LSPM founders. Suicide is a preventable cause of death, and you may be the only person in the life of someone you know who can make a difference and restore hope. This training program is designed to address our shared mission to help each other and the suicidal people we may meet on our journey through life. Message on Mental Illness Adopted in November 2012, this documents details the ELCA commitment as a church to accompanying those who suffer from mental illness, to advocating for just and dignified treatment, and to praying for healing and restoration. 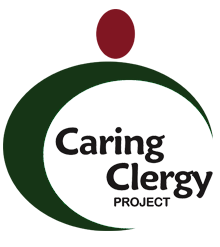 Message on Suicide Prevention (en Español) Adopted by Church Council of ELCA in November 1999, this document details the need for congregations to make suicide prevention an important concern in their educational and advocacy programs.